Click the button below to add the Grundfos IO101 Switch & Connection Controller for Solar Pumps with Generator Connection Cable to your wish list. 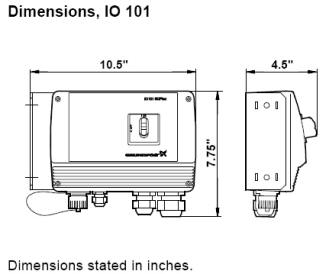 The Grundfos IO101 controller also provides the safe connection points for cabling from the solar array to the submersible pump & motor. Like the IO100, it provides manual on/off control and starts the pump in the morning and stops the pump in the evening. The unique feature of the IO101 is that you can connect a small generator directly to the IO101 using the power cable supplied with the unit. This allows you to operate the solar pump using any standard generator from 2.5 kW in cloudy weather or, if a large volume of water is required for some reason. Supplied with weatherproof cable glands, stainless steel screws in the cover, external on/off switch and a weatherproof cover to protect the electronics. The IO101 does not have terminals for a pressure or flow switch and if you need to control the operation of the pump with a pressure or flow switch, you will need the CU200 controller.